Twilight. Is. Here. 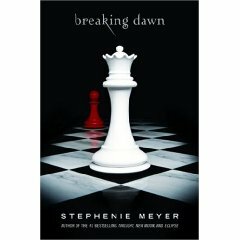 Breaking Dawn, the fourth and final book in author Stephenie Meyer’s “Twilight” series is being released tonight at midnight. I’ve never read any of the “Twilight” books, maybe because I’m not big into vampires and werewolves, though I’ve seen plenty of advertisements for them in the Borders Rewards e-mails I get. Fans of the “Twilight” books have been holding podcasts and online discussion forums for the past few months in anticipation of Meyer’s new release. Yesterday, I got caught up in the Twilight zone, too. I interviewed two sisters from North Texas who started an online “Twilight” fan club and who are going to lead a podcast at a Borders in New York City today to talk about Breaking Dawn. You can read my short piece here. It appeared in today’s GuideLive, which is the arts/entertainment section of The Dallas Morning News. Sisters Kallie Mathews and Kassie Rodgers, who run a fan-club Web site for author Stephenie Meyer’s Twilight books, have gotten used to creating podcasts from the comfort of their local homes. But today they’re taking their North Texas-based show on the road – more than 1,500 miles north to New York City. They’ll broadcast live from the Borders in Columbus Circle, a centerpiece in the chain’s national effort to promote tonight’s midnight release of Breaking Dawn, the fourth and final book in the wildly popular series. During the two-hour podcast, the sisters will lead discussions with fans about their predictions of what will happen to the characters in Breaking Dawn. They will be joined by three other Twilight aficionados from online fan clubs. The sisters launched their site in January. Their podcasts average about 10,000 downloads a week, Ms. Mathews said, and their site gets 15,000 hits a day. Kassie Rodgers, who runs a fan club Web site for author Stephenie Meyers’ “Twilight” books with her sister Kallie Mathews, has spent the past seven months talking and writing about the books’ characters, plots, and themes for the site. Today, Rodgers and her sister, both from North Texas, will lead a live podcast at the Columbus Circle Border’s in New York City to celebrate tonight’s midnight release of Breaking Dawn, the fourth and final book in the “Twilight” series. It’s a lot of fanfare and celebrating for someone who doesn’t like to read. For years, Mathews tried introducing her sister to books, but Rodgers always said no thanks. The only book Rodgers read for pleasure was the Bible. When she did read other books, it was because she had to for college. Are you a “Twilight” fan? What do you like/not like about the books? Great first article at the Dallas Morning News! It was short, but I’m sure it was hard to make it that short–and a lot of times, writing a really brief piece (espeically if it’s interesting, as this topic is) can be harder than writing 500 – 1,000 words. Interesting how a fictional book series can create passion like that. I haven’t read the Twilight books, but I know a lot about them based on their intersection with my mom’s — they have fairly similar audiences (though Twilight is more female-heavy). I think it’s funny that Twilight has such an appeal to girls, when its main female character is (from what I understand) an exceptionally weak woman. Is that something that came up at all in your conversations with those girls? Thanks, Kristina! Yes, I wanted to make the article longer but had to keep it short because of space constraints. Eric, that’s a good question. The books’ appeal to women didn’t come up in our conversation, but the issue of age did. The girls said it’s a common misconception that the “Twilight” books are just for young kids; they said they’re for people of all ages. I thought it was important to include the girls’ ages in the story to help show this point.